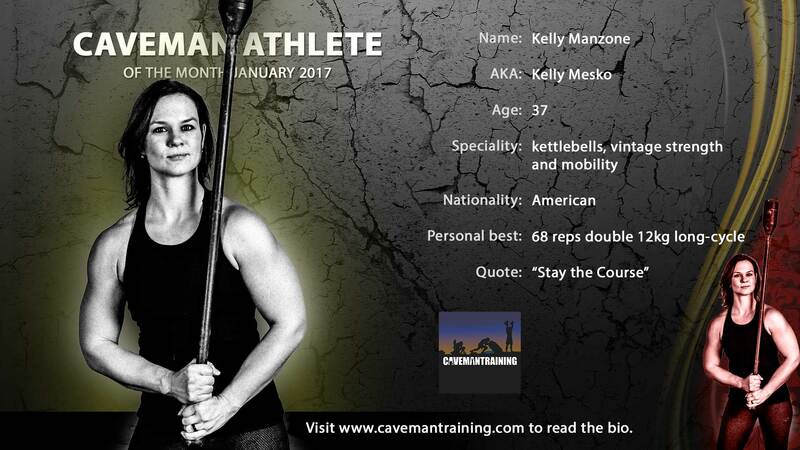 Please welcome Kelly Manzone our Caveman Athlete Of The Month January 2017. I’ve been active my whole life… Began gymnastics and dance at the age of 3, danced in ballet, tap and jazz till the age of 14 when my attention turned to swimming and track teams in high school. During college, I got interested in working out at mainstream gyms but was always drawn towards unconventional fitness, at that time, I was often approached and asked questions because people thought I was a personal trainer. I was typically the only woman in the weight room, it was then I decided that I had found my career and pursued getting certified to be a personal trainer. In 2008, my passion for unconventional training continued as I became more interested in sandbags, suspension systems, maces, clubs, etc. and of course kettlebells (I was also a yoga instructor for a few years). Yet, when I picked up a kettlebell, I immediately fell in love with this versatile tool. I love how it becomes an extension of the body while moving in all planes of motion. I get into the “zone” when I train with bells and I like the focus and patience it requires. I consider myself a hybrid, I’m a mix of hard style kettlebell, meets kb flows/complexes, meets kettlebell sport (I also currently teach barre classes). I believe in moving and moving often. I love all the mobility and kettlebell videos on Cavemantraining, I find that mobility training is one of the key elements to staying active as we age and it often is lacking in some fitness programs. I typically train 5-6 days a week…I’m always moving!! It’s not all about training hard, I find that as I age, I need more mobility and recovery work to keep my performance up. Becoming a mother has been my biggest achievement, my son, Leonardo recently turned 7. I hope I am raising a future man that has compassion and respect for others. I hope he sees the strength in women, that women are strong from the inside out. I hope he sees and learns from my determination, whenever I have been challenged by life, I have overcome. I truly believe that what doesn’t kill you makes you stronger. My immediate future goals are to improve in kettlebell sport as I am new to the sport. I want to also continue to compete in mace with vintage strength. Hopefully along the way, I can inspire other women to try the sport or explore unconventional training. I love the article on Cavemantraining about women and body image, it’s a topic that is quite relevant as I am a woman with an athletic build and enjoy various activities that require strength. There have been occasions when both men and women have made derogatory comments about my body, I’ve been called “bulky” and have been asked “you don’t want to start looking like a man now do you?”. At the age of 37, I’ve come to let those things roll off my back as I continue to peruse what makes me happy. Typically someone spewing energy like that is unhappy and uncomfortable with themselves. Since recently joining kettlebell sport, I find the community a haven from the negative energy. As I have been fortunate to find a community that supports and excepts people as they are and encourages others to peruse what makes them happy. How do I spread the word of exercise? Over the course of 15 years in the industry, I have developed lasting relationships and true friendships with personal training clients and students of my group exercise classes, I have such a passion for health and movement that I want to continue to guide and inspire others to move. Energy is key… just putting out good vibes while caring for others needs and lending them support when needed. Trough my instagram account @kellsbells88, my website KMmoves.com and my facebook page, I have been able to reach a broader audience through my video postings, mainly of which contain unconventional training. I’m really not into the “images” of women in mainstream fitness that we are constantly exposed to, I feel that message often misses the point. There is so much freedom in being your authentic self. Movement, exercise, training, what ever you want to call it, should challenge you; should make you feel stronger from the inside out, should make you feel healthy both mentally and physically. And while on the journey of life itself; surround yourself with those that inspire and support you. Life is short: live, laugh, love. Here is a video of Kelly Manzone, stay tuned and keep up to date with our facebook to see the new video coming out this week of Kelly Manzone. Let us know your thoughts below or on this Facebook post. Don’t forget to register with Cavemantraining for regular awesome articles, videos, workouts and interviews with unconventional athletes. All articles are posted to our facebook, so you can stay up-to-date by liking there as well.